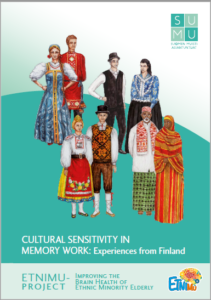 The ETNIMU project of The Society for Memory Disorders Expertise in Finland, published a guidebook called “Culture-sensitive memory work: Finnish experience”, meant for the specialists of social and health care sector, on the 3rd of October 2017. The aim of the guidebook is to expand the vision of specialists of how the clients of different cultural background should be treated in memory work practices. The topic is current, as the Finnish population of migrants are ageing and the memory-related diseases regard every one of us. According to the Statistics Finland there are approximately 310 000 foreign language speaking people living in Finland (referred as migrants). The memory-related diseases are as common among them as among the Finnish, Swedish and Sami speaking population. Based on the percentage corresponding to the national average, about 11 200 of migrants living in Finland have been diagnosed with milder form of impairment in data processing and 10 900 who have a developing memory-related disease. This is a large, but so-called invisible group of people who have no services specially focused on them. The specialists of social and health care sector need to acknowledge that the definition of memory problem means different things in different cultures. In some cultures, the symptoms of memory-related diseases are interpreted as the ‘normal age-related dementia’ or they are regarded as a taboo that one should be ashamed of. The fear of being sent to a psychiatric hospital could be a major hindrance in getting the treatment needed. The extra challenge is the language differences in the conduct of treatment: such definitions as the informal caregiver or health promotion are not recognized in all the languages. “Poor language skills and incomplete knowledge of the Finnish service system could be the reasons why migrants have no access to proper services. The fear of officials can increase this”, Siiri Jaakson, the project manager of ETNIMU emphasizes. Due to the cultural factors, the diagnozing of memory-related diseases is rare or such diagnoses will not be executed at all. We mostly deal here with misunderstanding created as a result of the lack of a shared language and communication. The published guidebook emphasizes that the specialists of social and health care sector should pay more attention to culture-sensitive method. It consists of three steps: acceptance, creating contact and building trust. The continuous reflection of one’s activities is also important for the specialist. “By working with the ageing people of immigrant background, the meaning of personal contact becomes increasingly important. The main aim is to pursue to find the individual person from behind the memory problems and cultural background. The sincere interest towards a human being enables the possibility of building trust. Also more time resources need to be given for communication is needed for that purpose“, Jaakson finds. The culture-sensitive know-how is required at both individual and management levels of heath care institutions, as well as part of the development of these organisations. “Addressing the special needs of multicultural groups will be a cheaper solution also for the employers and society in the long run. The training of relevant topics should also be provided to the specialists of social and health care sector“, Jaakson emphasises. The specialists should also discuss how their own cultural background influences the communication. “We all have some prejudices. The important tools in the recognition and creating of attitude are knowledge and respecting of human dignity. One does not need a thorough knowledge of all cultures, but one should dare to ask and be ready to listen to others“, Jaakson states. The guidebook was a part of The Society for Memory Disorders Expertise in Finland, ETNIMU project (funded by STEA, Funding Centre for Social Welfare and Health Organisations) with the aim to promote the brain health of elderly with ethnic background. The observations are based on the group work of ageing migrants and Roma people carried out within the frame of the project. The collection is consisting of three guidebooks fit as toolkits for specialists working with elderly people, and they were published within the frame of the project. The guidebooks were published in Finnish, Estonian, Russian and Somali languages. In the guidebooks cultural-sensitivity is used and cultural specificity minimized.